Bean burritos. Very simple. Very inexpensive. Very tasty. 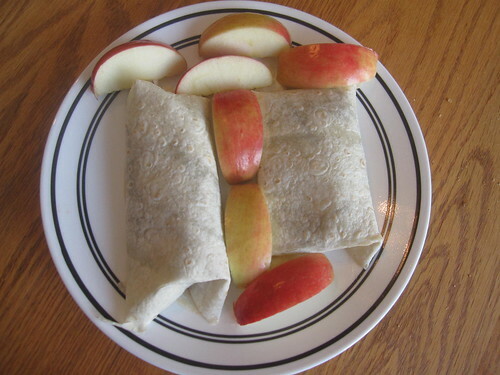 Freshly sliced apples on the side are a nice sweet accompaniment. You’ll need cooked beans, roughly two heaping tablespoons worth for each small burrito. You’ll need small tortilla shells. You’ll also need whatever toppings you’re going to want on it – salsa, onions, tomatoes, cheese, lettuce, guacamole, whatever it is that you love. I like to keep them very simple so I can taste the beans, so I just use lettuce, onion, and a bit of salsa. That’s it – pretty plain jane, in the end. If you’re using dried beans – which I highly recommend – put them in a tub of cold water the night before and leave them standing until you’re ready to start preparing your food the next day. The exact type of bean isn’t important, but I highly recommend using black beans. I suggest using 1/4 cup dried beans for each person who will be eating. Often, I’ll make a batch of beans using black beans as a baseline and adding a small amount of a few additional bean types, such as red beans or garbanzo beans (chickpeas). 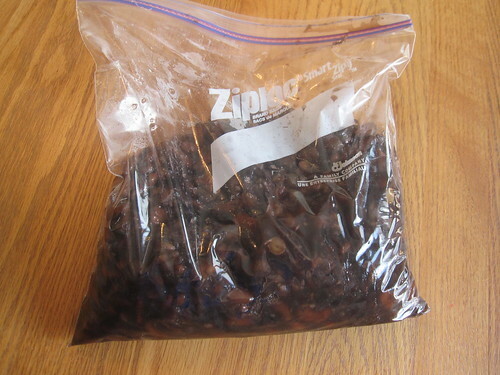 I also often make a large batch of these beans at once, using them for multiple recipes and storing them in the fridge between meals, as you can see below. Next week, I’ll be using these beans as part of another recipe. Your first step, if you’re using dried beans that have soaked overnight, is to cook them. Drain the beans, then place them in a pot of water that has about an inch and a half of clear water on top of the beans. Boil them for 75 minutes, keeping the boil relatively low the whole time but never letting the boiling stop. Once you have cooked beans, the process for making these is simple. 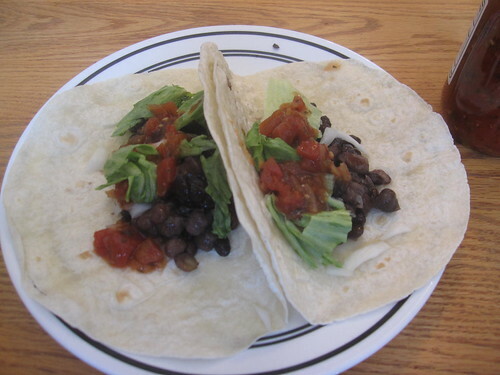 Take a few spoonfuls of cooked beans and place them on a tortilla, then add whatever additional ingredients you prefer. Salsa, onions, cheese, whatever makes you happy. Wrap it up and enjoy. You may want to heat some of the ingredients – particularly the beans – but that’s at your discretion. This type of meal is incredibly flexible. Obviously, if you don’t wish to use beans for this, substitute cooked ground beef and follow the same instructions. Beans are a much healthier option, though. The list of potential toppings is long: rice, guacamole, lettuce, tomatoes, onions, peppers – I’ve even tried sauerkraut before (seriously). Add stuff you like and you’ll never go wrong with a meal like this.